Kate Armstrong finds Bangkok's bustling eat streets are short on decor, long on flavours. My sojourn to the street stalls of Bangkok reminds me of the children's jingle: "This little piggy went to market, this little piggy stayed home ..." I am the little piglet on my way to market, not to be hung and quartered but to do what the locals do – revel in Thai street food. 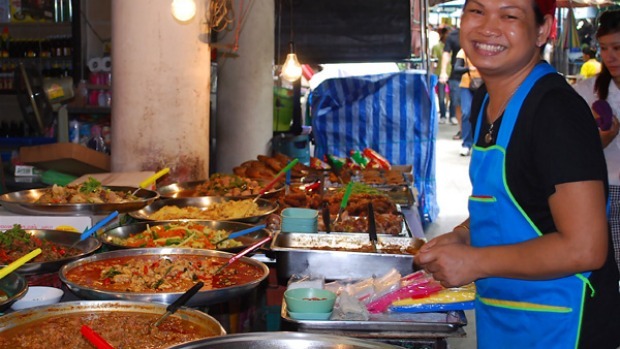 As I discover, Thai street food extends way beyond the best-known bites – pad thai, satay sticks, mango sticky rice and papaya salad. While the cuisine is unmistakably Thai in flavour and preparation, many dishes reflect historical and cultural influences from China, Malaysia and Cambodia. For first-timers to Bangkok (including myself), the vast number of street stalls, or hawker stalls, can be overwhelming. Hundreds of different dishes are served up by enterprising stallholders. I decide to confine my tastings to the stalls along a 50-metre strip on the busy thoroughfare of Rama IV. This strip typifies hundreds of boulevards and street corners, where many of Bangkok's 8 million or so people grab a bite each day. Eating at street stalls is central to their lives. My guide, Nam, explains: "Thai people love food. They are very particular about the quality. Most people come here [Rama IV] after work. If you live in a city, you can't fix on a time to get home. People travel for up to two hours to get home. Here, they can stop for their meal." It's Sunday evening (Monday is street-cleaning day so many stalls are closed), but the place is bustling. I breathe in Bangkok's muggy air, a complex mix of car fumes and drains, plus intoxicating garlic, chilli and lemongrass aromas. In front of me, trolleys on wheels and rickety tables form a crooked line along the strip of footpath. Plastic sheets serve as makeshift covers under which the traders – everyone from elderly men to young women – juggle plastic buckets, large pots and pans and tin cauldrons. Loud sizzles emanate from hotplates. Vendors whip up dishes on surfaces no bigger than a tea towel with the skill of Michelin-star chefs. The elaborate displays are striking. Piled high are vegetables: broccoli, asparagus and bean shoots. Ducks hang from hooks. Dried fish and unidentifiable meat entrails lie on racks. Then there are the condiments (Thais are especially keen on these) – vinegars, fish sauce, dried red chilli, garlic and sugar add a sweetness, bite or zest to any dish. For many Thais, street food starts and ends with noodles. All noodle types (and there are many), from flat egg noodles to thin rice varieties, come fried or in broths and stews. Customers can choose (and fine-tune) their favourite accompaniments: combinations of everything from mushrooms and lettuce, to fish and meats. As for my own culinary taste test along this strip? I have a wobbly start. I bypass the first stall, where pigs' innards and trotters lie boiling in a large pot. It doesn't help that a mangy pregnant cat is sprawled out beneath the trolley. The adjacent stall is another story. It sells kuay tiew lord, or rice paper rolls. Some are filled with chives, while others are stuffed with cabbage, shrimps and bean sprouts. At 50 cents each, these are among the best-value snacks around. Two young women mix up a dipping from chilli, vinegar and black sauces; mine errs on the sweet side. I roll my eyes and groan with delight. A family of four giggles at my When Harry Met Sally antics. Next is a scallop stop. Two women skilfully crack open scallop shells with a blunt knife and discard the empty shell halves into a red plastic bucket. I don't have the chance to sample the scallops as only hefty quantities (a quarter or half a kilogram) are available. The abutting juice stall serves up freshly squeezed orange, lime and tamarind, all for less than $1. Then comes a line of beheaded fish. These are a marvel of preservation – they've been cleaned, gutted and cooked with salt, then dried. They are then reheated on demand. I confess, these don't appeal and I move on. I nearly bypass the neighbouring stall, a well-worn table. Nam explains this sells mieng kham. Mieng kham is eaten as a snack, not a meal, and costs about $1.50. At first glance it doesn't look like much. Foam trays display a variety of small bags, whose ingredients – ginger, onion, shrimp, lime, peanuts, coconut and chilli – have been chopped into tiny pieces. Bright-green betel leaves are its most intriguing elements. The vendor, a young man, points. "Seb," he insists. Nam translates: "Good!" in Thailand's north-eastern dialect. Nam, clearly deft at origami, moulds the leaf into a small cup shape and carefully adds a pinch of each ingredient and, finally, the sauce, or "dipping". She folds it into a parcel and I'm instructed to put the whole thing into my mouth. "Seb" indeed. It's hard to know what's best: the crunchy texture of the fresh leaf and nuts or the explosion of flavours: zingy chilli, tangy lime and creamy coconut. During my alfresco taste tests, the clouds have blown in. It starts to drizzle. One stallholder, an elderly lady, ushers us to a dinted metal bench. We sit on two rickety stools, the grotty awning above providing some protection. Exposed electrical wires hang above our heads. We're passed an enamel bowl filled with scoops of soy and a broth, the name of which I don't catch. Steam curls upwards: it's spicy-sweet ginger and palm sugar. Small chunks of deep-fried dough float on the surface. I plunge in my plastic spoon. This broth packs a punch and the super-spicy ginger sends me into a coughing frenzy. Giggling, Nam says: "This also makes you ... um ..." Clearly embarrassed, with her hands she mimes a squirming action around her stomach, accompanied by a "whoosh". "Fart?" I volunteer inappropriately. Thais are extremely polite. Nam giggles again and bows in the Thai manner, her palms pressed together, to apologise for the subject of discussion. "Yes," she replies. I'm desperate to save face. I come up with an alternative that even Queen Victoria would find prudish: "Airing one's views." It does the trick. This warm, cheap and filling Thai comfort food that aids digestion is added to my growing list of favourites. The rain sets in. Then it pours. The footpath becomes a torrent. A young man with a plastic bag over his head pulls in beside us. Two others soon take shelter next to our table. Before long, we are a bedraggled group huddled together, sipping on our hot broth. A mere metre away, chaos reigns: there's a traffic jam despite the late hour, pots clank and lids fly as the stalls are forced to shut. Sadly, my sampling is forced to a watery end. Nam drives me to meet my friends in Soi Cowboy, a red-light playground popular among tourists. Seedy bars line the narrow street. I find my friends, who have taken shelter from the storm inside a Western-style drinking hole. Despite the district's bright neon lights, this place depresses me; it's a far cry from Bangkok's colourful street stalls. I make a quick exit with two friends. We hail a tuk-tuk, a motorised rickshaw, and brace ourselves for a damp ride. It's a fitting end to my wonderful street-stall adventure. The tuk-tuk has no sides, so we are partially exposed to the elements. Bangkok's sour odours and sweet aromas linger, despite the rain. We squeal like schoolgirls as we leave torrents of water and wind in our wake. And I admit (with apologies to Nam), this very sated little piggie airs her views "wee-wee-wee, all the way home". The writer was a guest of the Tourism Authority of Thailand, Dusit Thani Hotel and the Centara Hotel. Thai Airways flies daily between Sydney and Bangkok (from $800 return). From $140, Dusit Thani Bangkok (946 Rama IV Road) is in a great location near both the skytrain and metro. Phone +66 2200 9000, see dusit.com. From $300, Centara (CentralWorld) is large and comfortable with luxury trimmings. Phone +66 2769 1234, see www.centarahotelsresorts.com. Hawker stalls are found all around Bangkok. If you don't like the "stop anywhere" approach, good places to start are Chinatown, Sam Yan Market, Sukhumvit, Chatuchak and Ortorkor (Aw Taw Kaw).